TESSELLATING TULIPS This repeat block pattern is a nod to spring and the glorious fields of tulips of tulips that bloom here in the Pacific Northwest. Make a few blocks and its a great wallhanging. Make a lot of blocks and you have a charming bed quilt!! 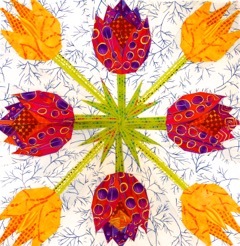 This pattern is available through Fiddlesticks Quilt Shop, (360) 718-7103.